Edward Frederic Benson (24 July 1867 – 29 February 1940) was an English novelist, biographer, memoirist, archaeologist and short story writer. E. F. Benson was born at Wellington College in Berkshire, the fifth child of the headmaster, Edward White Benson (later Chancellor of Lincoln Cathedral, Bishop of Truro and Archbishop of Canterbury), and his wife born Mary Sidgwick ("Minnie"). E. F. Benson was the younger brother of Arthur Christopher Benson, who wrote the words to "Land of Hope and Glory", Robert Hugh Benson, author of several novels and Roman Catholic apologetic works, and Margaret Benson (Maggie), an author and amateur Egyptologist. Two other siblings died young. Benson's parents had six children and no grandchildren. Benson was educated at Temple Grove School, then at Marlborough College, where he wrote some of his earliest works and upon which he based his novel David Blaize. He continued his education at King's College, Cambridge. At Cambridge, he was a member of the Pitt Club, and later in life he became an honorary fellow of Magdalene College. At Cambridge he fell in love with Vincent Yorke. Benson wrote in his diary: "I feel perfectly mad about him just now...Ah, if only he knew, and yet I think he does." Title page of Miss Mapp, 1922. Benson's first book published was Sketches From Marlborough. He started his novel writing career with the (then) fashionably controversial Dodo (1893), which was an instant success, and followed it with a variety of satire and romantic and supernatural melodrama. He repeated the success of Dodo, which featured a scathing description of composer and militant suffragette Ethel Smyth (which she "gleefully acknowledged", according to actress Prunella Scales), with the same cast of characters a generation later: Dodo the Second (1914), "a unique chronicle of the pre-1914 Bright Young Things" and Dodo Wonders (1921), "a first-hand social history of the Great War in Mayfair and the Shires". The Mapp and Lucia series, written relatively late in his career, consists of six novels and two short stories. The novels are: Queen Lucia, Lucia in London, Miss Mapp, Mapp and Lucia, Lucia's Progress (published as The Worshipful Lucia in the United States) and Trouble for Lucia. The short stories are "The Male Impersonator" and "Desirable Residences". Both appear in anthologies of Benson's short stories, and the former is also often appended to the end of the novel Miss Mapp. The last three novels were produced as a television series by London Weekend Television for the recently initiated Channel 4 during 1985–6 with the series title Mapp and Lucia and featuring Nigel Hawthorne, Geraldine McEwan and Prunella Scales; the first four have been adapted for BBC Radio 4 by both Aubrey Woods and (most recently) Ned Sherrin; the fifth, Lucia's Progress, was adapted for BBC Radio 4 during 2008 by John Peacock. During 2007, the television series was rerun by the British digital channel ITV3. A new 3-part adaptation written by Steve Pemberton was broadcast during three nights on BBC One; 29th, 30th, and 31 December 2014. Benson was also known as a writer of atmospheric and at times humorous or satirical ghost stories, which were often first published in story magazines such as Pearson's Magazine or Hutchinson's Magazine, 20 of which were illustrated by Edmund Blampied. These "spook stories", as they were also termed, were then reprinted in collections by his principal publisher, Walter Hutchinson. His 1906 short story, "The Bus-Conductor", a fatal-crash premonition tale about a person haunted by a hearse driver, has been adapted several times, notably during 1944 (for the movie Dead of Night and as an anecdote in Bennett Cerf's Ghost Stories anthology published the same year) and for a 1961 episode of The Twilight Zone. The catchphrase from the story, "Room for one more", created a legend, and also occurs in the 1986 Oingo Boingo song, "Dead Man's Party". Benson's story David Blaize and the Blue Door (1918) is a children's fantasy influenced by the work of Lewis Carroll. "Mr Tilly's Seance" is a witty and amusing story about a man flattened by a traction-engine who finds himself dead and conscious on the 'other side'. Other notable stories are the eerie "The Room in the Tower" and "Pirates". Benson is also known for a series of biographies/autobiographies and memoirs, including one of Charlotte Brontë. His last book, delivered to his publisher ten days before his death, was an autobiography entitled Final Edition. H. P. Lovecraft spoke well of Benson's works in his essay "Supernatural Horror in Literature", most notably of his story "The Man Who Went Too Far". Further "Mapp and Lucia" books have been written by Tom Holt, Guy Fraser-Sampson, and Ian Shepherd. 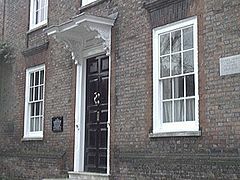 Lamb House, home of E. F. Benson and model for "Mallards" in the Lucia series. The principal setting of four of the Mapp and Lucia books is a town named Tilling, which is recognizably based on Rye, East Sussex, where Benson lived for many years and served as mayor from 1934 (he relocated there during 1918). Benson's home, Lamb House, served as the model for Mallards, Mapp's—- and ultimately Lucia's—- home in some of the Tilling series. There really was a handsome "Garden Room" adjoining the street but it was destroyed by a bomb during the Second World War. Lamb House attracted writers: it was earlier the home of Henry James, and later of Rumer Godden. He donated a church window of the main parish church in Rye, St Mary's, in memory of his brother, as well as providing a gift of a viewing platform overlooking the Town Salts. E. F. Benson is presumed to have been homosexual, but was intensely discreet. At Cambridge he fell in love with several fellow students, including Vincent Yorke, father of the novelist Henry Yorke, confiding to his diary "I feel perfectly mad about him just now...Ah, if only he knew, and yet I think he does." In later life Benson sustained friendships with wide circle of gay men, and shared a villa at Capri with John Ellingham Brooks. (Prior to the First World War the island was popular with wealthy homosexuals). Homoeroticism and a general homosexual sensibility suffuses his literary works, such as David Blaize (1916), while his most popular works are famed for their wry and dry camp humour and social observations. Benson was a good athlete, and represented England at figure skating. He was a precocious and prolific writer, publishing his first book while still a student. Nowadays he is known principally for his Mapp and Lucia series about Emmeline "Lucia" Lucas and Elizabeth Mapp. In London, Benson also lived at 395 Oxford Street, W1 (now the branch of Russell & Bromley just west of Bond Street Underground Station), 102 Oakley Street, SW3, and 25 Brompton Square, SW3, where much of the action of Lucia in London occurs and where English Heritage placed a Blue Plaque during 1994. Benson died during 1940 of throat cancer at the University College Hospital, London. He is buried in the cemetery at Rye, East Sussex. "The Room in the Tower", "Gavon's Eve", "The Dust-Cloud", "The Confession of Charles Linkworth", "At Abdul Ali's Grave", "The Shootings of Achnaleish", "How Fear Departed from the Long Gallery", "Caterpillars", "The Cat", "The Bus-Conductor", "The Man Who Went Too Far", "Between the Lights", "Outside the Door", "The Other Bed", "The Thing in the Hall", "The House with the Brick-Kiln", "The Terror by Night"
"And the dead Spoke...", "The Outcast", "Machon", "Negotium Perambulans...", "At the Farmhouse", " Inscrutable Decrees", "The Gardener", Mr Tilly's Seance", "Mrs Amworth", "In the Tube", "Roderick's Story", "The Horror Horn"
"Reconciliation", "The Face", "Spinach", "Bagnell terrace", "A Tale of an Empty House", "Naboth's Vineyard", "Expiation", "Home, Sweet Home", "And No Birds Sing", "The Corner House", "Corstophine", "The Temple"
The Step; The Bed by the Window; James Lamp; The Dance; The Hanging of Alfred Wadham; The Wishing-Well;The Bath-Chair, "Pirates", "Monkeys", "Christopher Came Back", "The Sanctuary", "Thursday Evenings", "The Psychical Mallards". Desirable Residences and Other Stories (1991). Edited by Jack Adrian. The Collected Ghost Stories of E. F. Benson (Carroll & Graf, 1992) Edited by Richard Dalby (Omnibus ed of The Room in the Tower, Visible and Invisible, Spook Stories and More Spook Stories, with the addition of an essay on "The Clonmel Witch Burning".) Despite its title, the collection does not include any of the stories collected in The Flint Knife. Fine Feathers and Other Stories (Oxford University Press, 1994). Edited by Jack Adrian. The three 'Spook Stories' printed here do not appear in The Flint Knife or The Collected Ghost Stories. The Collected Spook Stories (Ash-Tree Press; Vol.1: The Terror by Night, 1998; Vol. 2: The Passenger, 1999; Vol. 3: Mrs Amworth, 2001; Vol. 4: The Face, 2003; Vol. 5: Sea Mist, 2005). This series collects all of E. F. Benson's supernatural fiction. ^ a b "Benson, Edward Frederic (BN887EF)". A Cambridge Alumni Database. University of Cambridge. ^ Introduction by Prunella Scales to Dodo: An Omnibus. Introduction in 1986 edition from The Hogarth Press. Original publication of novels 1893, 1914, 1921. ^ "New adaptation of E. F. Benson's 'Mapp and Lucia' on BBC1". 21 December 2014. ^ "Snopes entry on the urban legend based on the Benson story". Snopes.com. Retrieved 23 April 2014. ^ "Lamb House in Rye, East Sussex". www.ryesussex.co.uk. Retrieved 9 December 2016. ^ "E F Benson". www.tilling.org.uk. Retrieved 10 May 2018. ^ "Review: Account Rendered by E. F. Benson". The Athenæum (no. 4350): 273. 11 March 1911. Bleiler, Everett (1948). The Checklist of Fantastic Literature. Chicago: Shasta Publishers. pp. 47–48. Palmer, Geoffrey and Lloyd, Noel. E. F. Benson As He Was, Lennard Publishing, 1988. Vicinus, M. (2004). Intimate Friends: women who loved women (1778–1928). Chicago: University of Chicago Press. ISBN 0-226-85563-5. Wikimedia Commons has media related to Edward Frederic Benson.